Whether it’s image processing or earthquake measurements, this compute node can handle it. 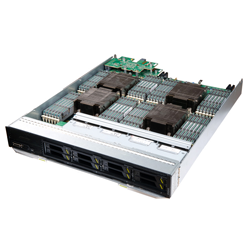 It is designed for virtualization, cloud computing, and High Performance Computing (HPC) clusters — and applications such as image and signal processing, financial algorithms, scientific computing, and seismic processing — all of which require high performance and large memory capacity. 48 DIMMs provide the memory capacity of up to 3 TB DDR3 — high cost-efficiency for large-memory applications and high storage capacity on a single node. Light 2.5-inch SAS/SATA HDDs or SSDs, or SSDs — twice as many hard disks for internal storage as competitors’ 4-socket blade servers. Reduces O&M costs with remote deployment and fault location technologies such as SOL, KVM over IP, virtual DVD-ROM drive, WebUI, and IPMI 2.0-compliance. 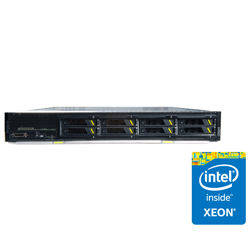 Nodes include efficient, secure power consumption analysis and control capabilities, including power-off mode and Intel® NM 2.0 compliance.